Enhanced Abilities: Lineage has super human strength and durability. Ancestral Enhancement: Lineage has access to the soul or the consciousness of anyone sharing Lineages bloodline', from the first Inhumans, and possibly only the Inhuman ones, be it ancestors, descendants or distant relations, these manifest as faces on his body. They retain all of their memories of life and seem to willingly share this information with Nobili. Resistance to Telepathy: While not having telepathic immunity, accessing Lineage's mind proved to be deadly to at least some low-level telepath who had his brain destroyed after ten seconds in his mind. Claws: Lineage has a set of claws. Gordon Nobili was part of a criminal organization that used his intellect to outsmart his rivals and enemies. 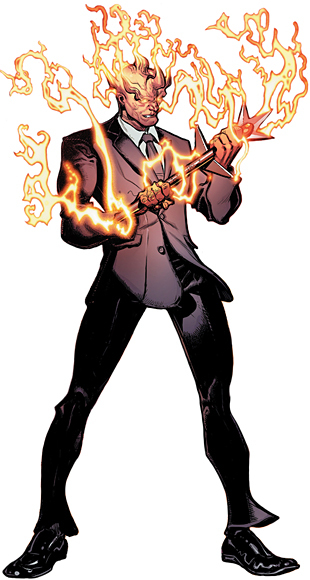 He learned he possessed Inhuman DNA when he was exposed to the Terrigen Mists after a Terrigen Bomb was set off by the Inhuman King Blackbolt. He was transformed into a purple-skinned creature with access to his ancestors knowlege.